The brooch is part of a set which was given to Princess Alexandra by the Prince of Wales as a wedding present in 1863 and which she wore on her wedding day. 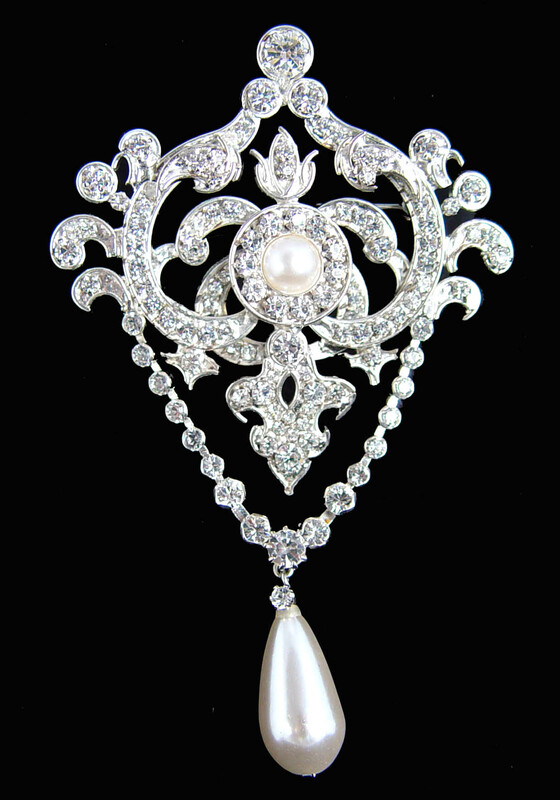 The brooch is set with three pearls and has three detachable pendant pearls suspended from single large diamonds. The set belonged to Queen Elizabeth the Queen Mother since the accession of King George VI in 1936. Our replica is made as near as possible to the original piece. 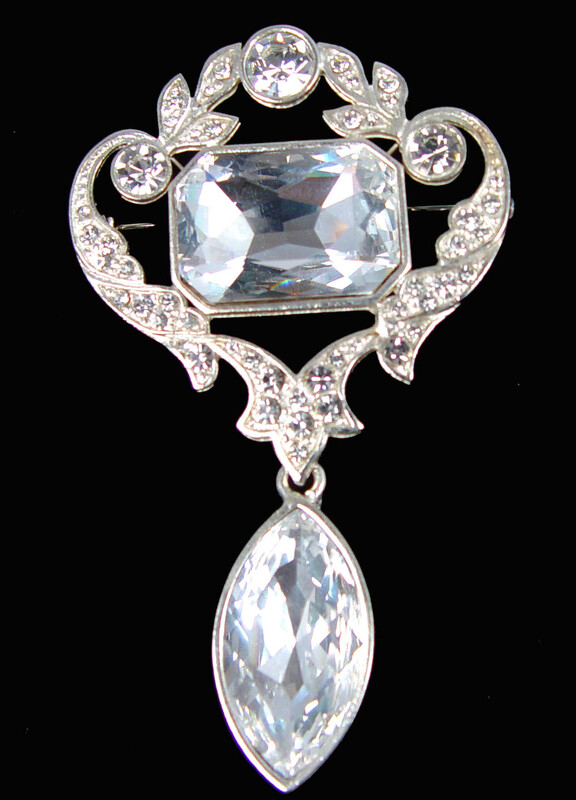 Queen Mary used the Cullinan VII an 8.8 carat marquise cut stone as a pendant to the Cullinan VIII, a 6.8 carat oblong brilliant to form a second brooch. Our replica is as near as possible to the original. The brooch is finished in silver plating. 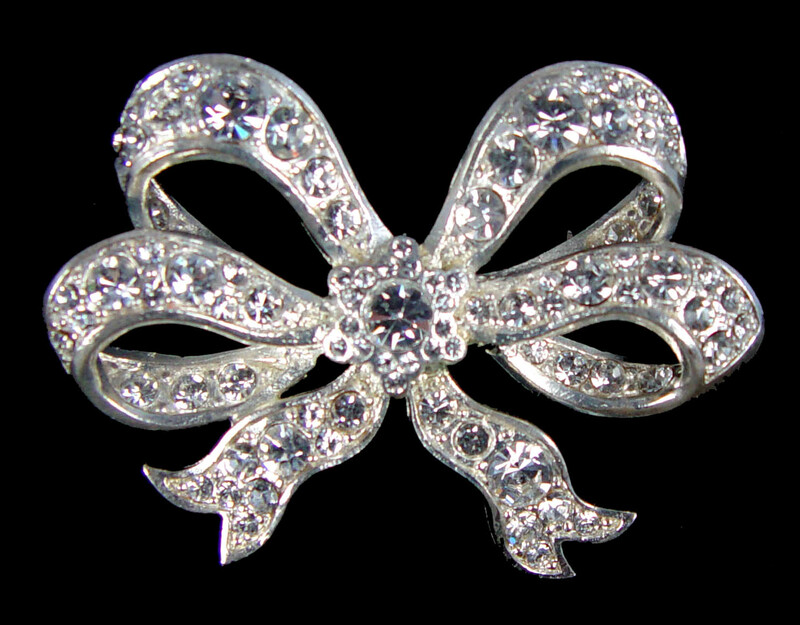 Bow brooches have been very popular since the 17th century. In May 1858. 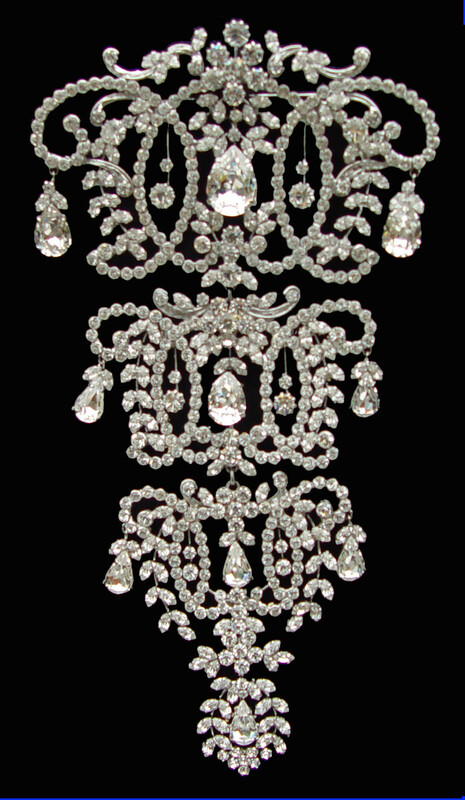 In May 1858 three brooches were made out of 506 diamonds which were supplied by Queen Victoria, but they were worn by Queen Alexandra and Queen Mary at their coronations. The brooch was a wedding gift in 1866 to Princess Dagmar of Denmark on her marriage to the Tsarevich Alexander, from her sister and brother in law, the Prince and Princess of Wales. 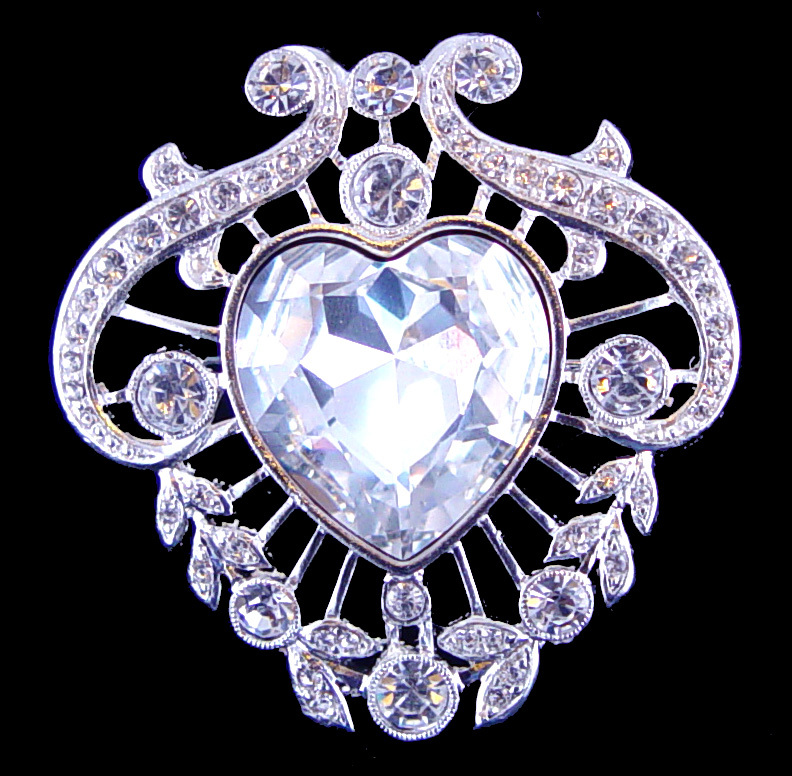 Queen Mary purchased the brooch from the Dowager Empress Marie’s Estate in 1929. The Queen inherited the brooch in 1953. Our replica is as made as near as possible to the original piece. It is finished in silver plating. Queen Elizabeth’s brooch is a festoon design of diamonds with a pearl centre and a pearl drop hanging from a looped chain of diamond collets. It was a gift to Queen Victoria in 1897 from the members of her household in celebration of her golden jubilee. She left it to the crown in 1901. It came to Queen Elizabeth in 1936. Our replica is as near as possible to the original piece. It is finished in silver plating. 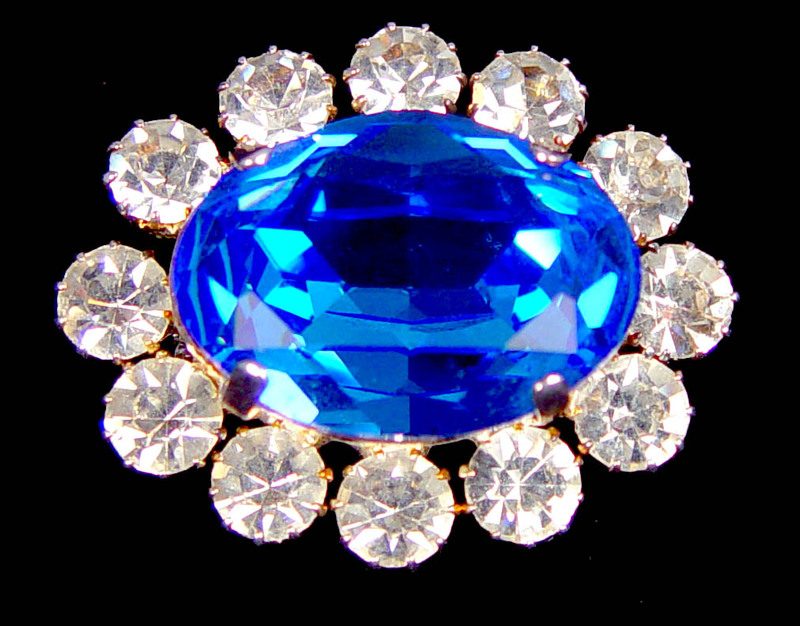 The magnificent brooch of a large oval sapphire was given to Queen Victoria by Prince Albert of Saxe-Coburg-Gotha on Sunday 9th February, 1840 at Buckingham Palace. It was the day before their wedding. For their wedding in The Chapel Royal, St James’s Palace, she wore it with her Turkish diamond necklace and earrings, In her will she instructed that it was to be considered a crown piece of jewellery and held in trust for all future Queens of Britain. Queen Alexandra wore the Prince Albert brooch pinned on the right of her bodice for her coronation in 1902. 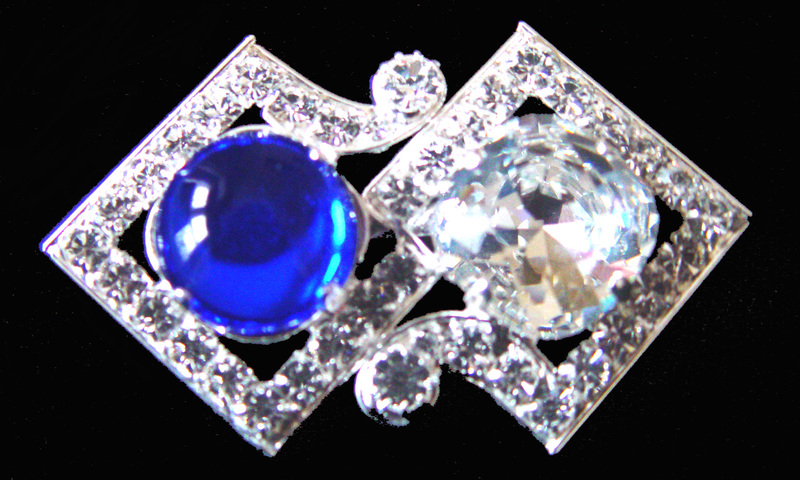 The brooch was often worn by Queen Mary. Our replica is made as near as possible to the original piece. It is finished in silver plating. 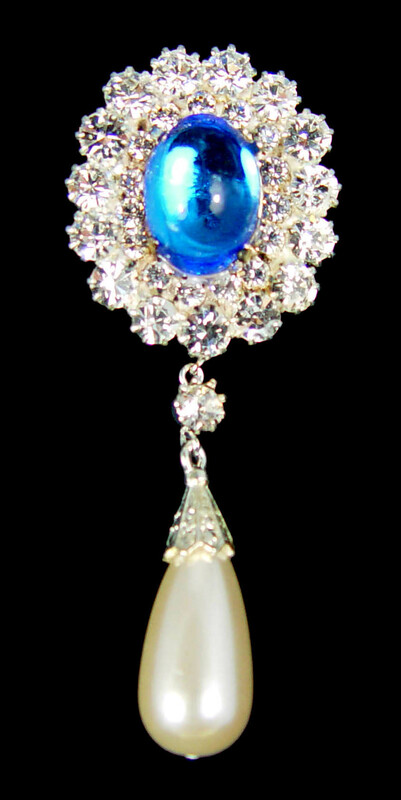 In July 1893 The Committee of the Kensington wedding gift fund representing the inhabitants of Kensington visited Princess May of Teck’s home at White Lodge, Richmond, and presented her with this bow shaped diamond brooch with a large oriental pearl drop. She wore the brooch at King Edward VII’s coronation in 1902 and at her own coronation in 1911 as an appropriate symbol of her childhood at Kensington Palace. Our replica is made and near as possible to the original piece. It is finished in silver plating. At the time Queen Mary was given the 102 Cullinan cleavings in 1910, she had no idea she was to acquire the Cambridge Emeralds which came into her possession later in the same year. 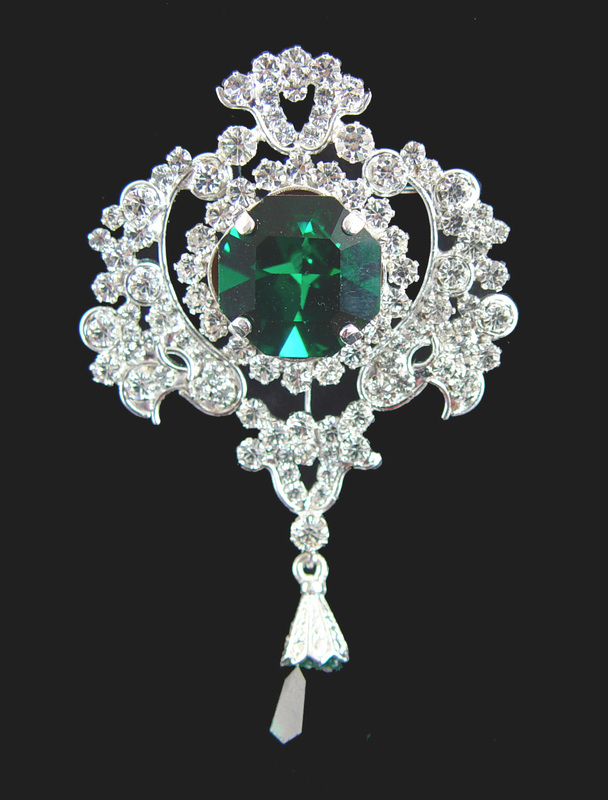 The brooch made to show off the Cullinan V, an 18.8 carat hear shaped stone, then became the centre of the massive diamond and emerald Stomacher. Queen Mary wore the brooch in 1911 pinned to simple day time dresses we wore aboard ship as she and the King travelled to India for the Delhi Durbar. Stomachers first became popular in the 15th century and were designed to cover the front of the bodice. As fashions changed, so did the shape of the bodice. When the waistline disappeared altogether in the early 1920’s, stomacher quickly sank into oblivion and were divided into smaller wearable brooches, or the stones were used for completely different pieces of jewellery. Queen Mary give this 8” Victorian stomacher to the Queen as a wedding gift in 1947. It is designed as a series of intersecting circles. 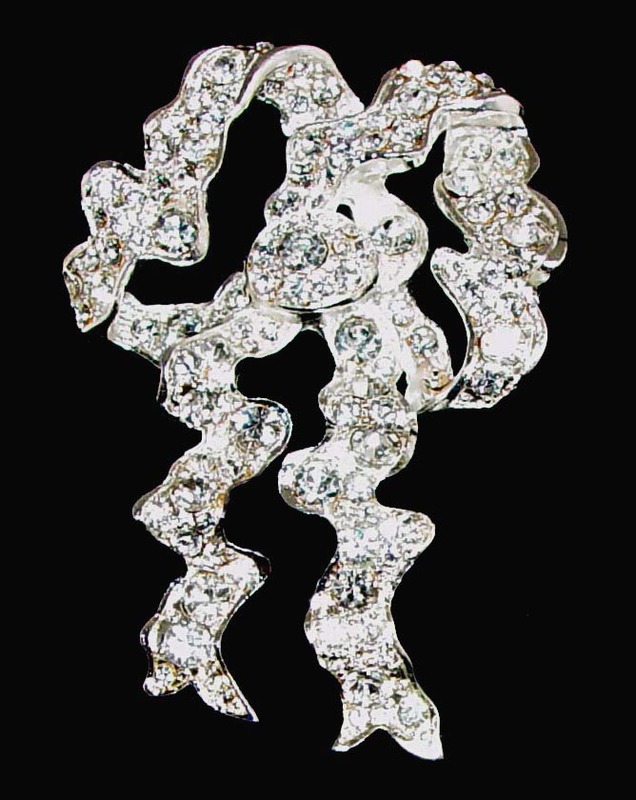 It has ten diamond drops and divides horizontally into three separate brooches. Our replica stomacher is made as near as possible to the original piece. It is finished in silver plating. This splendid jewel is typically Victorian. It was made to be big and impressive but not as grand as the stomacher. 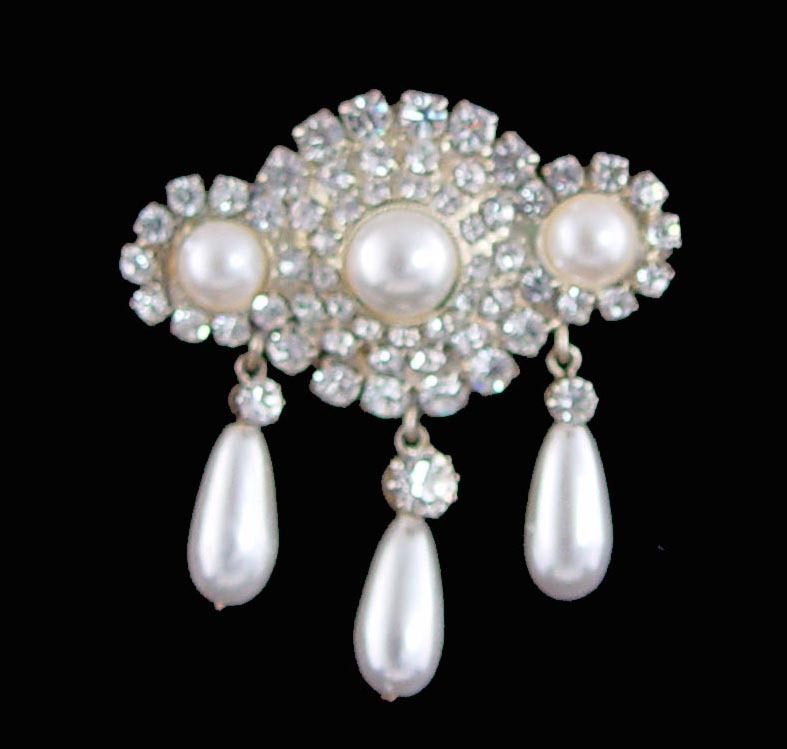 The brooch has a large pearl set into the centre which is surrounded by diamonds. This circle of diamonds is in turn enclosed in a basket weave frame set with diamonds. A further twelve diamonds surround the frame around the edge. 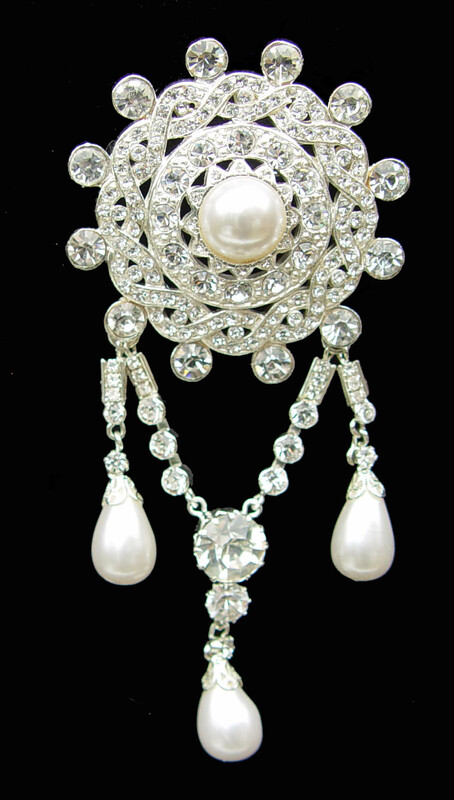 From this hangs a “U” shaped drop of diamonds which end in three pearl drops. The brooch was inherited from Princess Mary Adelaide, Duchess of Kent in 1897 by her daughter, the future Queen Mary, who gave it to the Queen in 1947 as a wedding gift. Our replica brooch is made as near as possible to the original. It is finished in silver plating. 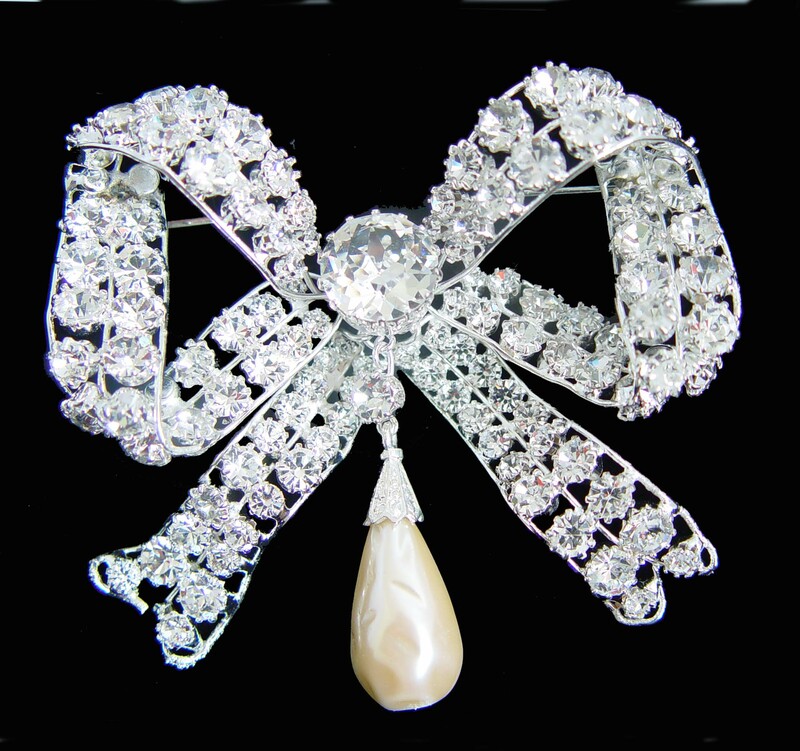 A True Lover’s Knot Brooch is a large diamond bow with scolloped edges and diamond tassels.